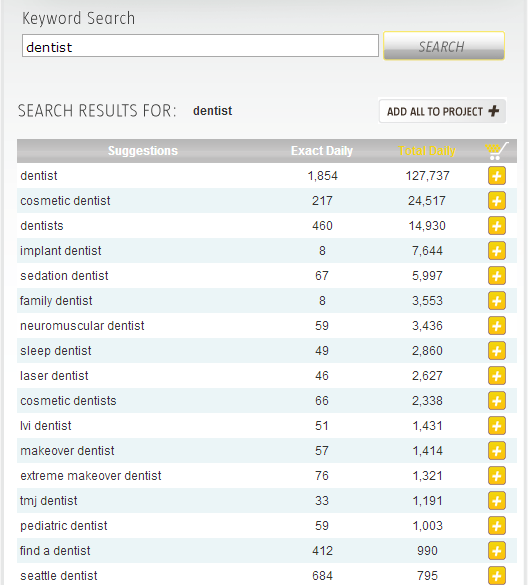 Keyword research and selection is perhaps the most important aspects of any dental SEO campaign. Before you even start building your website, you should conduct comprehensive keyword research to understand consumer demand for dental treatment and procedures in your target location(s). Based on the search volume and SEO competition you can then short list some primary and secondary keyword for each page of your website. Later, you will optimize each page of your dental website for these primary and long tail keyword phrases. Over time, these website pages will start appearing in top spots for search queries related to these short-listed keywords. Our SEO experts have a lot of experience with dental related keywords and can find low competition and high value keyword phrases that can help you get some search traffic quickly. We use several different keyword tools, competitor research tools and dental glossaries to unearth hundreds of relevant keyword phrases for you to choose from. The more keywords you target, the more traffic you can generate from search engines in the long run. Once we have a large database of keywords and phrases, consumers are using to find local dentists, we can assess the user intent, commercial value, search volume and SEO competition for each keyword. These criteria are used to assess the feasibility of each keyword phrase. We try to estimate how much traffic can be expected from each keyword if a top ranking is achieved and also how much time and money it will take to achieve a top ranking for that keyword. Based on this data, a short list of relevant keywords is prepared around which the website will be optimized. The aim of an SEO campaign is to rank you dental website among the top spots for search results pertaining to these short-listed keywords. After a short list of keyword phrases is ready, we group related keywords together. Each group is then assigned to individual pages of the website. For e.g. pediatric dentist, kids dentist, childrens dentist are all related keyword phrases that would logically be assigned to the pediatric dentistry page of a dental practice website. Similarly keywords like crooked teeth, under-bite correction, over-bite correction may be assigned to the orthodontics page of your dental website. Once all keywords have been assigned to each page on your website, you can optimize the content of that page using these selected keyword phrases.